34 I WRAPS I 2015 B u s i n e s s & s a l e s Rod's vision for the company has and always will be about creating eye catching designs to help our customers grow their business, while still managing to offer world class customer service to every customer. Gatorwraps continues to do this through diverse services such as vinyl wraps, business cards, brochures, websites, flyers, banners, decals, and much more. But there was one service that we did not offer and it began to spark Rod's interest: window tinting. Window Tinting a natural Fit "Over the years, we found that wrap installers with previous experience in window tinting often made the best candidates for us, when it comes to hiring a wrap installer," Voegele says. "This, combined with a growing number of customers inquiring about window tinting, made the decision to add window tinting services an easy one. Last year, we decided to make the transition into offering window tint services to our customers." Initially, Gatorwraps started advertising to its current customer base so that we could get the logistics of it all ironed out. With such a large client database, it was not long before Gatorwraps became a high-volume window tint business alongside its many other services. Gatorwraps only uses 3M FX Premium window film for our window tint installations, but has recently started offering the 3M Ceramic Series films. Research showed that 3M offers the best window tint film on the market. They also offer a great templating software package that could be used with the vinyl cutter we already had in our shop. It was a natural choice for us to become a 3M distributor. advantages and Challenges One of the many advantages to offering window tint is the ability to cross-train our installers. We recently started cross training our window tint specialists to do vehicle wraps and also cross trained our vehicle wrap installers to do window tint. It has been a huge benefit to the company and the installers. It also allows for a lot more flexibility when unexpected scheduling conflicts arise. Becoming a high volume tint business does come with its fair share of challenges as well. "We have found that the hardest part of the window tint business is keeping up with the demand," Voegele says. 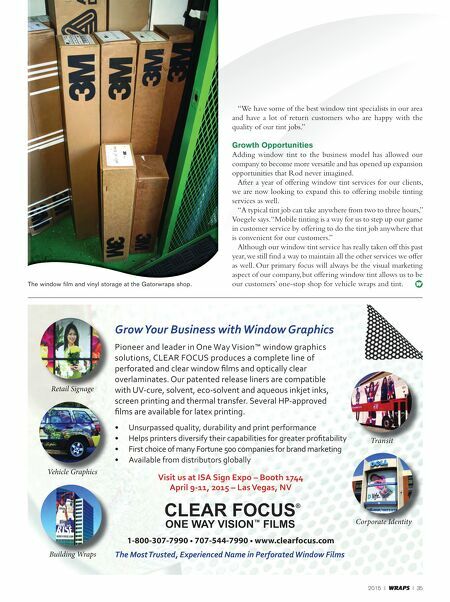 "Although we have been training our wrap installers to tint, we must still maintain and grow the wrap side of our business as well. We needed to find tint installers who could work fast and keep up with the high volume of appointments we were scheduling." Gatorwraps strives to provide the best to our customers when it comes to all our other services, so Rod would not settle for anything less when it came to window tinting. 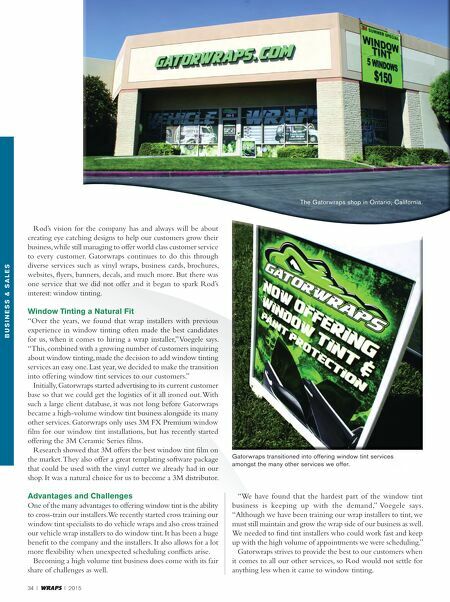 The Gatorwraps shop in Ontario, California. Gatorwraps transitioned into offering window tint services amongst the many other services we offer.